Abell TL, Parajuli D. (2017) Nausea and Vomiting Related to Autonomic Nervous System Disorders. In: Koch K., Hasler W. (eds) Nausea and Vomiting. Springer, Cham. 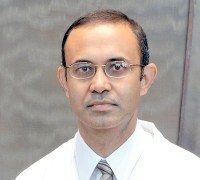 Ahmed S, Patel C, Schmitt C, Parajuli D. A Deadly Connection: Aortoenteric Fistula as a Cause of Acute Upper Gastrointestinal Bleeding. ACG Case Rep J. 2016 Apr 15;3(3):152-3. doi: 10.14309/crj.2016.32. eCollection 2016 Apr. PubMed PMID: 27144187; PubMed Central PMCID: PMC4843139. Kirpich IA, Parajuli D, McClain CJ. Microbiome in NAFLD and ALD. Clin Liver Dis (Hoboken). 2015 Sep 1;6(3):55-58. Epub 2015 Sep 29. PubMed PMID: 26576267; PubMed Central PMCID: PMC4643302..
Saire Mendoza M, Parajuli D. Colonic Polypoid Gangioneuroma. Practical gastroenterology, Apr 2015, Volume: XXXIX, Issue: 4,p-66-68.